Investors Kevin O'Leary and Barbara Corcoran discuss the Theranos CEO. "Shark Tank" stars weighed in Thursday on "The View" on charges made against Theranos founder and CEO Elizabeth Holmes for allegedly defrauding investors out of $700 million with her promise of a new blood test that would revolutionize health care. Once reported to be the youngest self-made female billionaire, Elizabeth Holmes dropped out of Stanford University at 19 years old and started Theranos in 2003. In April 2016, the U.S. Securities and Exchange Commission launched an investigation against the technology company. Entrepreneur Kevin O' Leary told "The View" he had a chance to invest in Theranos while it was being syndicated, but ultimately didn't. "What bothered me about it was, I couldn't do my own due diligence," he said of the potential deal. While still in talks with Theranos, O'Leary went on to say that when someone on his team asked the company why they weren't able to see the blood test product, he claimed Theranos' response was that they're "just lucky that we're letting you buy $5 million of this deal." "Whenever you hear that from anybody, ever, that should be red flags everywhere, and that's exactly what happened here," O' Leary said. "When you hear that kind of BS, you should really think, wait a minute." "This will change forever how these large startups get funded, because people are going to want to see themselves what's inside the black box," he added. Holmes reached a settlement with the SEC in March 2018 after the regulatory agency charged her with "massive fraud,” with no admission of wrongdoing; however, she is now awaiting a criminal trial on charges of wire fraud and conspiracy to commit wire fraud and if convicted, faces decades in prison. 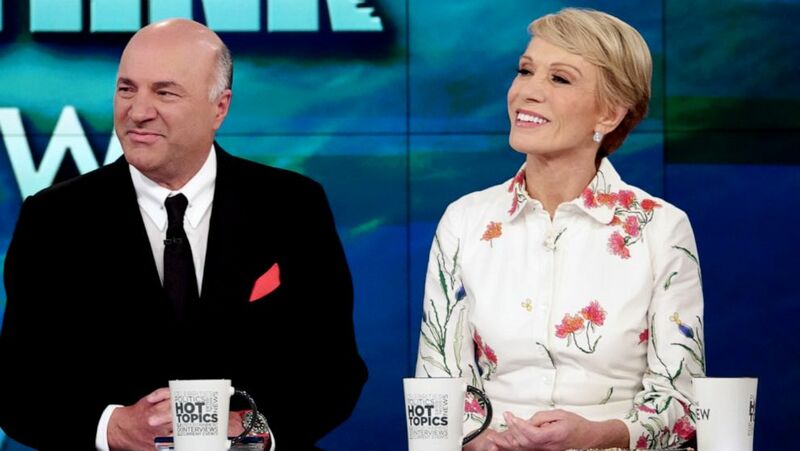 (Nicolette Cain/ABC) Shark Tank" investors Kevin O'Leary and Barbara Corcoran discuss Elizabeth Holmes on "The View, "April 11, 2019. Businesswoman and investor Barbara Corcoran doesn't think Holmes' story will drastically change the startup landscape in the long run. "People are going to remember for the next six months, and then boys being boys, they always want to measure up to the next guy," she said. "People can convince themselves of anything," Corcoran said. "Every con ... in some degree ... believes what they're saying and then they kind of get caught in their own muck and they don't know how to get out of it." On April 22, Holmes and her former Theranos COO Ramesh “Sunny” Balwani have a status hearing at the federal courthouse in San Jose, California. The two were indicted on nine counts of wire fraud and two counts of conspiracy to commit wire fraud. ABC News launched a three-year investigation into Theranos and Holmes — who some had called "the next Steve Jobs" — and released a six-part podcast and 20/20 documentary, both called “The Dropout.” Both Balwani and Holmes have pleaded not guilty to those charges. The two-hour documentary included exclusive access to never-before-aired deposition tapes with Holmes, Balwani, Theranos whistleblower Tyler Shultz, and more.